The 650 C circular saw performs extremely well on a wide range of logs – especially dirty, dry, bent logs, or those which have various flaws such as rot in the centre. 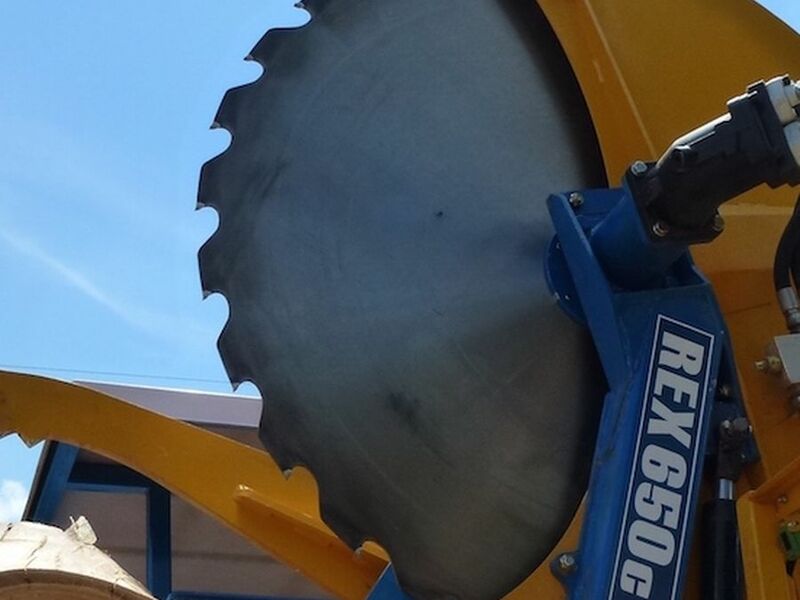 The circular saw will handle logs from 1.5 – 6.5 meters long, and up to 650mm diameter. The 28 tooth x 1.5 meter diameter Tungsten tip blade is driven by a fuel efficient 70hp Yanmar 4TNV98 diesel engine – cycle times have been recorded at 10 – 12 cuts per minute for 400 – 500mm logs. Logs are loaded onto the log deck with a loader, fed into the trough using a hydraulic chain drive system and then fed into the saw head using a unique log pusher system. An increment system ensures even block length and blocked timber is carried away by the 5m conveyor for splitting or stockpiling. Importantly, the operator’s working environment is safe, as they are well clear of the saw zone. This model is available in two options: wide & regular trough. The wide trough model can effectively handle multiple small logs/sleeper backs up to 4m long, and incorporates a double log clamp & high back log pusher. The regular trough model will handle single logs from 1.5 – 6.5 meters long, and up to 650mm diameter. Designed & built in Australia using very heavy duty construction, quality engine & hydraulic components, this machine will give many years of productive, trouble free service. This machine is WorkCover compliant making it ideal for firewood businesses who are seeking to reduce their liability. PRODUCTION POSSIBILITY: One operator is capable of processing in excess of 150 cubic meters cubic of logs per day (guide only). CAPACITY NARROW TROUGH: Will cut logs up to 650mm diameter, 1.5 – 6.5 meters long. BLADE: 28 tooth x 1520mm diameter tungsten tip blade. Simple 240 V ‘on saw’ sharpening system. MOBILTY: Fully self contained & yard towable. SAWDUST: Shute contains and collects sawdust. INNOVATIVE DESIGN: Highly productive and efficient with minimal labour requirements. OPERATOR SAFETY: Operator works comfortably & safely sitting at a console. This machine is WorkCover compliant making it ideal for firewood businesses who are seeking to reduce their liability.